I installed the DH And I connect an iPhone 7, a Note 8, and a Pixel XL running 8.1 android. None of them has gone past showing present at home. I have numerous locations setup besides home, and tried going into them last night but none of the 3 ever showed up leaving our home. Anyone have any ideas? I am asking about Android app, not Android data handler. The android app is on the play store and the app store, but you also need the DH installed as well for it to work. have you also installed the app and followed in installation instructions? I just opted into the beta and it says the app was last updated 10/18/17. Is that correct? @ady624 over the last few weeks the webCore app has been crashing and android has been closing it down. Its now logging it as a issue on the device, has anything changed in the phones? I want to update my piston state if i’m connected with my wifi. disable the automatic piston state if you want to manually control the state. You cant update the piston state manually if you do not disable automatic piston state. If you have a concern about taking away the automatic control for the piston state I hope I can ease your mind by saying all this does is say true/false based on whether the piston evaluated to true or false. You can essentially disable automatic piston state and never set a piston state and your piston will be unaffected by this. So far so good. I’ve installed the webCoRE app on my Galaxy S7, my wife’s S8 and on my daughters’ android-based Blackberry. Unfortunately I’m finding that my wife’s Galaxy S8 is having issues with the webCoRE presence sensor. 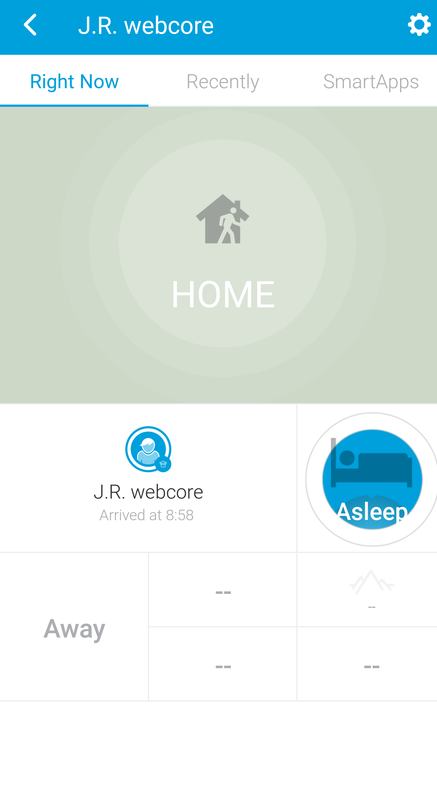 The SmartThings app says she left home at 7:15am, but WC says she left at 8:04am. ST and WC have the same 7:14am time for my departure time. The same applies when she’s arriving home. I’ve set the circle home zone to 130m… so that shouldn’t be it. I’ve made the same battery optimization setting to both ST and WC on her phone… why the big time difference? Perhaps I’m missing a settings step for her S8? I’m struggling to make this work… I’ve followed the instructions without any errors but the device in the SmartThings app shows ‘Arrived at 23.07 on 01/08/18’ and does not change. Any thoughts? I uninstalled and re-installed and this I have this same problem now. I was finally wanting to move the presence sensor over to my main webcore instance. I tried just registering it with my other instance but it did nothing. (edit: It did add the device and I do see the new device in Smartthings) So I removed the device and uninstalled webcore on the phone. Reinstalled webcore, added it to my main instance. Now I see no updates or changes anywhere. Just shows me as arrived. Even if I manually set myself to “not present” nothing changes. No log entries in smartthings for the device and nothing on the device itself. So the new device did add. I was able to go into the app and setup the “name” of the device and hit apply. The name changed in smartthings. But no updates of any kind. It is set to Automatic. Hi experts, can we programmatically write a piston to tells us when the sensor arriving/leave the places that we’ve created? I want to write a piston to notify me when the presense sensor arrive or leave a specific location I’ve created. TIA. This I can help with…even though my sensor isn’t working at the moment. As an example when you create an if statement. Select your new presence sensor. Then in the dropdown box you will see a whole new list of options. arriving at, currently, etc. In your case “arriving at” then changes to, and enter the name of your custom place. Ok, Thanks. Let me try to see how it goes. Do I need to set any variable like the outer & inner circle? Above when you said “specific location I created” you should have already done that. This one is dependent on your wifi connection—i.e. better router = better accuracy. So it depends on your hardware, size of home etc. as to whether it is efficient. Comparatively, I run the webcore presence sensor on a Pixel XL on Android and see no significant battery drain. @ady624 so far now no matter what I do I can’t get a working presence sensor. Started from scratch three times now. I have the device. It’s registered to the instance. I see events in the IDE when it registers and changes the name. After that, nothing. opening the device on the phone and I see blanks for every field. No logs, nothing. It all was working fine. Until I removed it and was attempting to associate it with my main instance. After removing my test instance I even went back and made a new instance and new sensor. Completely removed app and instance and started from scratch. Still nothing. Any ideas?